Thomas Becket (ca. 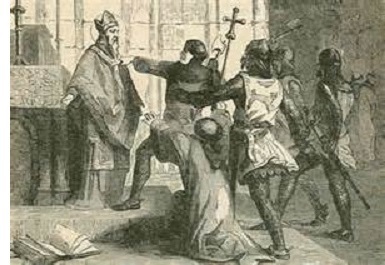 1118-1170) - The bane of Henry II of England, Thomas Becket (also known as Thomas á Becket) was Archbishop of Canterbury (which is essentially the head of the Church of England) from 1162 until 1170. He was written about by many of his contemporaries so his life is pretty well documented. Born on December 21 (the winter solstice, however the Catholic Church made it into the feast day of St. Thomas the Apostle) in London, he began his education early (at about age 10) and was taught by Catholic priests (probably at St. Paul's Cathedral). This brought him into contact with Theobald of Bec, who was the (powerful) Archbishop of Canterbury from 1139 to 1161. Theobald was impressed with the young Becket and took him into his employ, entrusting him with many responsibilities. He made several important journeys to Auxerre, Bologna and even Rome, and studied canon law along the way. In 1154, Theobald appointed Becket to be Archdeacon of Canterbury, which was basically the archbishop's highest ranking subordinate. It was about this time that he came into contact with King Henry II. When the position of Royal Chancellor to the king opened in 1155, Theobald recommended Becket for the job. Henry accepted and the two became friends initially. As chancellor, his primary responsibility was to keep the nobles in line (in terms of making sure that taxes flowed into the state treasury). However, when Thoebald died in 1161, Becket was nominated and elected to be the next Archbishop of Canterbury. As the highest ranking church official in England, this naturally led to some friction between Becket and Henry. Whether Becket was himself hungry for power or just thought he was exercising the legitimate authority of the church is not certain, but he began to challenge the king on several fronts. Likewise, Henry believed his power over his kingdom to be absolute. A major sticking point was over the priests of England. The king argued they were subject to secular courts, the archbishop insisted they could only be disciplined by the church. Henry tried to legislate the matter by drawing up the Constitutions of Clarendon. Although the majority of England's priests were willing to accept the king's authority, Becket refused to sign the documents. Henry responded by trying Becket for contempt of royal authority and malfeasance while serving as Lord Chancellor (whether or not the second charge was a false one is unknown) in October 1164. He was convicted on both charges, but fled to mainland Europe before sentencing. 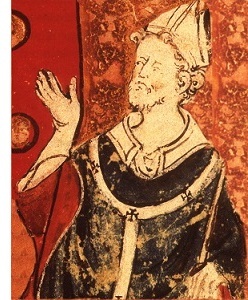 Louis VII of France offered him asylum, but Henry still pursued Becket. While in exile, the archbishop threatened to excommunicate the king. Pope Alexander III finally had to intervene and sent delegates to England in 1167. But the matter was not resolved until 1170 when the Pope threatened to excommunicate the entire country of England, including both the king and archbishop. At that point, Henry agreed to allow Becket to return to England and resume his duties as archbishop. But that did not ease the tension between them. In June of that year, the Archbishop of York, the Bishop of London and the Bishop of Salisbury, all anointed Henry's son, Henry the Younger, to be his successor. Becket claimed that they had exceeded their authority and excommunicated all three. Upon hearing this, King Henry was heard to have uttered something under his breath which was interpreted as a death warrant on Becket (his exact words are lost to history, but the most commonly accepted are, "Will no one rid me of this turbulent priest?"). Four of his knights took it as exactly that and rode to Canterbury. Upon arriving, they left their swords outside under a tree and entered the cathedral wearing mail armour under their cloaks. They demanded that Becket return with them and answer to the king for his actions. When he refused, they walked outside, retrieved their weapons and returned inside. History dramatically holds that Becket was struck down while praying at the altar, but this is uncertain. Regardless, he was killed by Henry's men on December 29, 1170. Word of the assassination spread throughout Europe, and Becket was quickly venerated as a martyr. The outcry over the death was so strong that Henry was compelled to do public penance, and Becket was canonized as a saint only two years after he died.